There has been a lot of discussion in recent weeks and months about the “mismatch” between the type of crude which is being produced and the design capabilities of existing refineries and proposed expansions. While light shale producers continue to surprise on the upside, heavy crude production has been declining due to the collapse of the Venezuelan oil industry, stagnation in Mexico and pipeline takeaway limitations out of Canada. This is all taking place as refinery expansions in recent years have continued to be focused more on medium and heavy crudes, as are many of the projects expected to be completed in the near future. As a result, a refining industry with a growing appetite for the heavier grades instead is being offered a diet which is disproportionally light. This has resulted in a significant narrowing of the light/heavy spread, with the LLS (St. James) and Maya (FOB Mexico) differential averaging less than $4 per barrel (equivalent to only a 6% Maya discount) thus far this year. To put this in historical perspective, the discount has not averaged below $5 per barrel since 2001 on an annual basis and has never been as low as 6% for any three month period of time. As we think about situation, the classic Stones tune – “You Can’t Always Get What You Want” comes to mind. In today’s blog we examine how refiners will respond to this “mismatch” and whether they ultimately “will get what they need”. Refiners often find themselves chasing an elusive target. They understand that new capacity additions need to align with the quality of crudes which are being produced in order to maximize the return on investment. Because it can take five or more years to plan, approve, fund, design and construct new process units or refineries, it is imperative to not just assess the quality of crudes being produced today but also what is likely to be produced in the coming decades. Nimble refiners who are quick to realign themselves to new production grades can often find they are able to take advantage of advantageous pricing anomalies before their slower competitors can catch up. While this concept may be easy to grasp, it can often be difficult to execute. Refiners are prone to viewing the production world in a static mode and tend to construct new facilities which coincide with existing crude qualities. Anticipating the development of new fields can be problematic as they are often delayed and new crude grades can introduce new processing issues; such as high TAN (Total Acid Number), high pour, or compatibility with other crudes. When there is a shift in production however, refiners are sometimes caught unaware. An example of this was the shale revolution which began in 2008. By the turn of the century, Canadian output was rising rapidly and further increases were expected to add substantial volumes of heavy crudes in addition to those being supplied by Mexico and Venezuela. Between 1990 and 2000, Canadian output rose by over 400 MBPD (a 27% increase). U.S. refiners reacted accordingly, and announced numerous expansion projects to take advantage of further heavy production increases. Most of these expansions centered on coking unit additions and supporting hydrotreating increases. By 2013, numerous heavy crude expansions had been completed, including a 130 MBPD increase at ConocoPhillips Wood River (50 MBPD net crude increase), a 180 MBPD increase at Marathon Garyville, and shift of 260 MBPD at BP Whiting (adding 40 MBPD of new capacity). Even before these units were completed however, the emphasis began to swing to lighter crude grades with the advent of the shale developments beginning in 2008. The rapid increase in the light and super light crude grades surprised the U.S. refining industry which was still focused on processing increasing volumes of heavy crudes. The inability of the U.S. refining industry to adapt to the rising production levels of light crudes in conjunction with significant infrastructure limitations (exacerbated by the ongoing crude oil export ban) created dramatic pricing anomalies in the Permian and Williston Basins. These pricing distortions further stimulated refiners to expand light crude processing capabilities, even in spite of the previous shift to heavy grades. 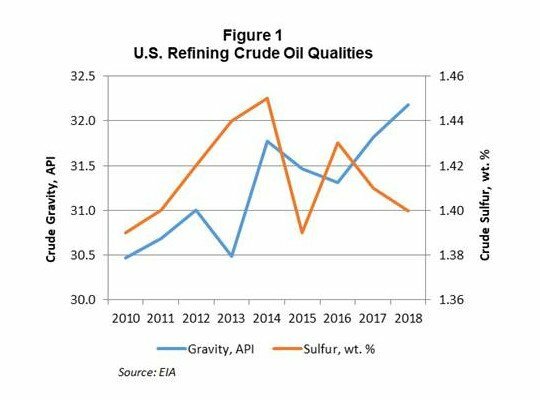 Between 2010 and 2018, the average crude gravity processed at U.S. refineries increased from slightly under 30.5 ºAPI to nearly 32.8 ºAPI (Figure 1). The ending of the crude oil export ban in December 2015 alleviated the refining restriction on continued U.S. growth of light crude production. Complicating the picture for refiners however, is the impact which politics has on creating mismatches between oil production qualities and refining requirements. The economic collapse being seen in Venezuela has all but shut off crude exports from the country. For coking refineries on the Gulf Coast, this has forced a significant shift in crude purchases as they scramble to find alternate suppliers. A similar, but less severe, condition is also seen in Mexico. While President Obrador has indicated a general desire to continue with Pemex reforms, he has also made numerous other statements which would indicate otherwise. With oil output from Mexico continuing to decline, the future remains clouded. Whichever way Mexican output goes, it is more likely to be impacted by political decisions than economic ones. Because of the unexpected declines in production from Venezuela, and to some extent Mexico, and the continued increase in output from the Shale basins, the light/heavy crude spread has shifted dramatically. The LLS/Maya spread was in the $11-12 per barrel range in April and May of last year but fell to below $5 per barrel for 1Q19. While the production of various crude grades has been very erratic in recent years, the future is likely to be just as chaotic. How long the turmoil in Venezuela will persist is unknown, but it is likely that the longer it does continue the greater will be the damage to the production facilities. It will take years for production to resume to historical levels even if regime change were to occur quickly. The country suffers from both a lack of capital and technical expertise. While production capabilities abound in Latin America, the dominant question for Canada is pipeline exit capacities. Alberta remains constricted and the need for another major pipeline is rising rapidly. Again, politics appears to be the dominant factor with environmental groups becoming more assertive in slowing or stopping Canadian bitumen production growth. One of the greatest uncertainties which could increase crude grade concerns for refiners are the impending IMO shift to low sulfur bunker fuel in January 2020. The apparent strategy that many global refiners are moving toward is to switch to a lighter and sweeter crude slate to either minimize or eliminate the production of high sulfur residual fuel. With the U.S. being a dominant producer of lower sulfur crudes, these regulations could create a sharp spike in demand for these grades. While this would be a boon to U.S. producers, it also has the capability to substantially increase prices for the lighter grades. This pricing shift is likely to significant enough to induce refiners on the Gulf Coast, which currently process substantial volumes of Eagle Ford, Bakken, and the sweeter Permian grades, to switch to what will become lower priced Brent, Urals or Arab Light. In addition to the increased demand for the very light sweet crudes, the IMO regulations are also likely to reduce demand for heavy crudes. Some of the surplus high sulfur fuel oil will become a feedstock to coking refineries either in the form of coker feed or blending with light grades to produce a synthetic heavy crude. The combination of the increased demand for light crudes and decreased demand for heavy grades may well reverse the recent narrowing of the light/heavy crude differential back to historical levels. After 2020, the markets will gradually readjust to higher vessel scrubber levels, increased coker rates, etc. which could stimulate yet another reversal of the light/heavy crude spreads. With the plethora of potential of production possibilities, refiners face the challenge of an ever-changing crude quality picture. Refineries with the capability to process varying crude qualities will have significant advantages over those locked into a narrow processing range. Optionality in the refining world remains a key advantage. This subject is discussed in greater detail in both our recently released 2019 World Refinery Construction Outlook (WRCO) and the 2019 Crude and Refined Products Outlook (C&RPO), which we issued in February. The developments and trends discussed here play an important role in our overall analysis of refinery investment activity, global and regional crude supply, demand and pricing and are accounted for in the forecasts we make for each of these, which are included in these reports. For more information on either the WRCO or the C&RPO, or on any of our other analyses or consulting capabilities, please send us an email or give us a call. In closing, we would like to extend to all of you celebrate this special week, wishes for both a Happy Easter and a Peaceful Passover.